Company: Keep in schools of 3-4+, 6+ is ideal. They do well with other friendly fish species. Aquarium Setup: 10-15 Gallons minimum tank size. Sand or gravel substrate, rough substrate is not recommended. This species like a planted tank with driftwood. The Skunk Cory is more sensitive to water conditions than most Corys and requires good filtration and water parameters to thrive. Water Changes and vacuuming the gravel are a must. Sexing: Females will appear wider when viewed from above. The female Skunk Cory is often less colorful. 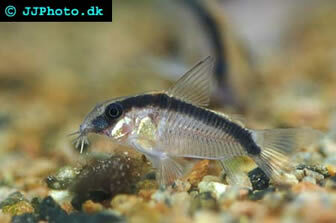 Breeding: Though this is one of the harder Corys to breed, breeding is similar to other Corys. The female carries a few of the eggs between her pelvic fins while the male fertilizes them. She then hides them in a safe spot, She usually choose a spot with dense vegetation. They will continue this process until around 100 eggs have been placed in different spots. A PH of 6.5 - 7.0 is ideal and using cold water (approx. 60 F) for water changes is a must to induce spawning in this species, live foods will also increase the likely hood of spawning. Special Behavior: It is important to note that this species of Corydora is nocturnal, but can learn to be active in the daytime as well.